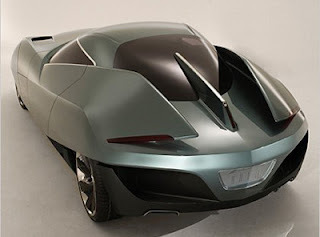 The Alfa Romeo BAT is an Italian concept car. 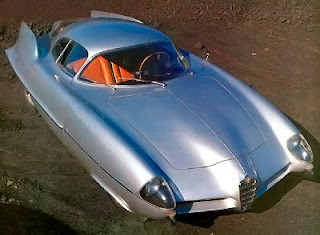 The car originated in a joint collaboration project between Alfa Romeo and the Italian design house Bertonethat began in 1953. 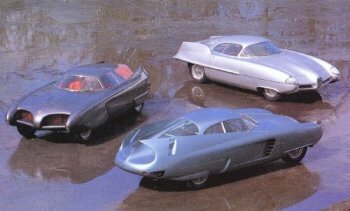 Of the successful project came three cars: the BAT 5 in 1953, the BAT 7 in 1954, and finally the BAT 9 in 1955. All three cars were designed by Franco Scaglione. The cars were successful in their goal, the best achieving a drag coefficient of 0.19, an achievement even by today's standards. For each of the cars, Alfa Romeo provided a five-speed gearbox and a powerful four-cylinder engine that produced more than 90 horsepower (67 kW), good enough to propel the car to a top speed of 201 km/h (125 mph). 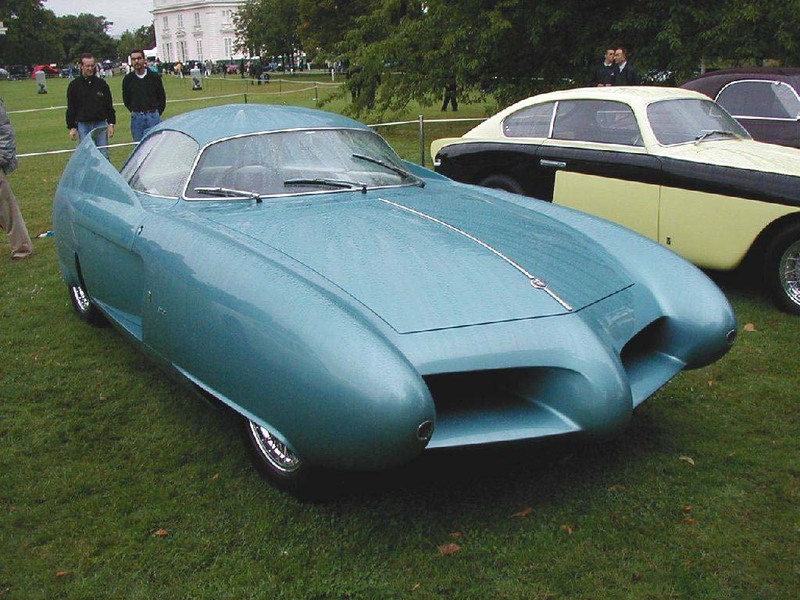 The BAT 5 was the first of the Bertone-Alfa Romeo BAT project. It was first shown at the Turin Auto show in 1953. The design of the model was based on a study of aerodynamics. The shape of the front in fact aims to eliminate the problem of airflow disruption at high speeds. The design also aims to do away with any extra resistance generated by the wheels turning, as well as achieving a structure which would create the fewest possible air vortices. In practice these rigorous criteria would allow the car to reach 200 km/h (120 mph) with the 100 hp (75 kW) engine mounted as standard. 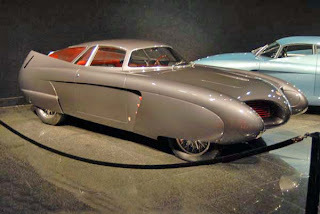 The design that Bertone came up with was for an extremely light car (1,100 kg (2,400 lb)), the ultimate in streamlining, with side windows at a 45 degree angle with respect to the body of the car and a large windscreen which blends in perfectly with the almost flat roof. The most surprising part of the car has to be the tail, with the length-ways rear windscreen divided by a slim pillar, and the two fins tapering upwards and slightly inwards, for a highly aesthetic finish. There was no shortage of positive feedback: the car was an immediate hit for its aerodynamics and noteworthy stability at high speeds. Bertone had solved the problem of aerodynamic stability, creating a car with an excellent index of penetration, with a Cd of 0.23. The BAT 7 features in the Top Gear book Daft Cars by Matt Master. After more than 50 years, there is a new BAT model. The BAT 11 made its début in Geneva, at the time of the 2008 Geneva Auto Show, though not at the show itself. The new BAT 11, based on the Alfa Romeo 8C Competizione, shares many styling cues with the classic BAT cars of the 50s. Last updated on 11 March 2013 at 15:58.